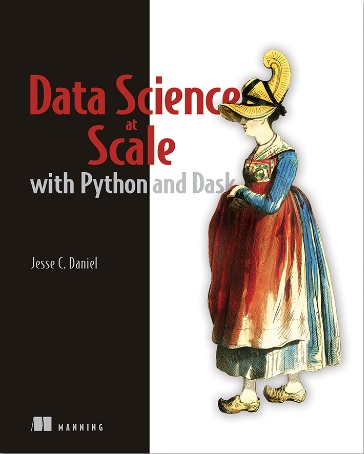 Get Data Science at Scale with Python and Dask for 37% off normal price by entering code fccdaniel into the discount code box at checkout at manning.com. To make the most of this article we will be using the “Amazon Fine Foods Reviews” dataset, train a sentiment classifier model with Dask ML that can interpret whether a review is positive or negative without knowing the review score. The dataset can be found here. Now that you’ve tagged the reviews, we need to turn the review text into a format that the machine learning algorithm can understand. Humans intuitively understand that if someone says a product is “great”, that person likely has a positive sentiment towards the product. Computers, on the other hand, don’t generally share the same grasp of language that humans do—a computer doesn’t intrinsically understand what “great” means or how it translates to sentiments about a product. Think about it, if a person says a product is “great,” they probably feel positively towards the product. This is a pattern we can search for in our data. Were reviews which used the word “great” more likely to be positive than reviews that didn’t? If this is true, we could state that the presence of the word “great” in a review makes it more likely to be positive. 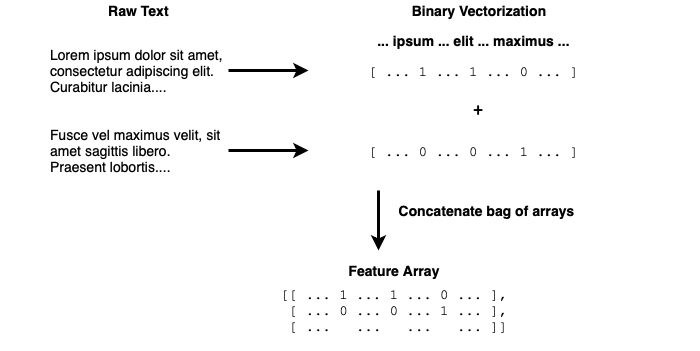 This is the whole idea behind one common way to transform text data to a machine understandable format called binary vectorization. Using binary vectorization, we take a corpus, or a unique list of all words that show up in our review data, and generate a vector of 1s and 0s, where a 1 indicates the presence of a word and a 0 indicates the absence of a word. In Figure 1, you can see that the words which appear in the raw text, such as “lots” and “fun,” are assigned a 1 in the binary vector, whereas words that don’t appear in the raw text (but appear in other text samples) are marked with a 0. Once the text has been transformed with binary vectorization, we can use any of the standard classification algorithms like logistic regression to find correlations between the presence of words and the sentiment. This, in turn, helps us build a model to classify reviews as positive or negative where we don’t have the review score. Let’s take a look at how to transform our raw reviews into an array of binary vectors. Listing 6 contains several new methods that we’ll unpack. First is the concatenate function from the Dask Array API. It concatenates, or combines, a list of Dask Arrays into a single Dask Array. Because we ultimately want to combine each of the 568,454 vectors into one large array, this is exactly the function we want to use. Because the data is spread out across roughly 100 partitions, we’ll need to reduce each partition’s list of arrays into a single array, then combine the 100 partition-level arrays into one final large array. This can be done with the reduction method of Dask Array. This function works slightly different from map in that the function passed to it should receive an entire partition instead of a single element. After mapping the from_array function to each element, each partition is a lazy list of Dask Array objects. This is exactly what input dask_array.concatenate wants. The partition object passed into our stacker function happens to be a generator object, which dask_array.concatenate can’t cope with. Therefore, we need to materialize it into a list by using a for comprehension. You may think, at first, that this is counterproductive because materializing the partition into a list brings the data with it, but the partition happens to be a list of lazy Dask Array objects, and the only data that gets shuttled around is some metadata and the DAG tracking the computation which has occurred. We can see that we get the result we want because the new Array shape states it’s 568,454 rows by 100 columns. The shape of the feature array can be seen in Figure 4. Listing 7 is straightforward – because we’ve already gotten the feature array into the shape that we want through the concatenating we did in Listing 6; we only need to save it. We reuse the concatenating code on the target array data to follow the same process for the target data. The only new item worth pointing out is our decision to rechunk the data. You might have noticed after the concatenation that the array had a chunk size of (1,100). This means that each chunk contains one row and 100 columns. The ZARR format writes one file per chunk, meaning we’d produce 568,454 individual files if we didn’t rechunk the data. This is extremely inefficient because of the overhead involved with getting data off of a disk—this is the case whether we’re running Dask in local mode or on a large cluster. Typically, we’d want each chunk to be somewhere between 10MB and 1GB to minimize the IO overhead. I’ve selected a chunk size of 5000 rows per chunk in this example, and we end up with around 100 files, similar to the 100 partitions that the raw data was broken into. We also follow the same process of converting the target variable to an array and writing it to disk. Now we’re finally ready to build our model! In Listing 8, now that we’ve done all the hard work for data prep, building the model is relatively easy. The train_test_split function randomly splits off a holdout set for us, then it’s as simple as feeding the features (X) and targets (y) to the fit method of the LogisticRegression object. It’s worth mentioning that we set the random_state parameter of the train_test_split function to 42, and you may be wondering why. The value of this parameter doesn’t matter – what’s most important is that you set it. This ensures the data is split the same way every time the train_test_split function is called on the dataset. This is important when you’re running and comparing many models against each other. Because of inherent variability in the data, you could, by random chance, test on an easy or difficult to predict holdout set. In this case, the improvement (or worsening) of the model you’d witness wouldn’t be because you did anything to affect the model. Therefore, we want to make sure the data is “randomly” split the same way every time the model is built. After a few minutes, the model will be trained and ready to make predictions. Then, it’s time to score the model to see how good of a job it does predicting reviews it hasn’t seen before.